I remember when I was a kid gathering up stacks of quarters and rushing off to the convenience store full of excitement to play 1942, the World War II-themed vertically scrolling shooter. I can still recall the sounds of exploding enemy planes and the rising pressure when I was down to the last quarter with only one bomb left and a screen full of foes threatening to end my valiant attempt at beating the game. Bomb’s Away: iFighter puts you in the cockpit of a World War II fighter plane as you take to the skies to battle the Axis powers. As soon as I saw iFighter from Epic Force, I was taken back to those days of classic arcade action. 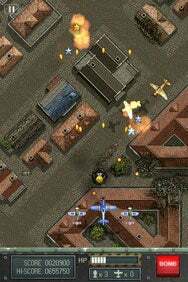 iFighter for the iPhone or iPod touch is a scrolling shooter game in which you are the pilot of a vintage WWII fighter plane on a mission to destroy as many Nazi planes, tanks, ships, and guns as possible. Survive a level, and you’ll find yourself facing powerful bosses. Defeated enemies leave behind stars and medals for you to collect for extra points as well as the occasional power up like health, bombs, extra fire power, or two flanking wingmen. Unlike many other similar games which often overload on power ups, iFighter has these bonuses in short supply. Epic Force’s approach in this game was not to continually dole out the power ups and extra men, but to make the game an actual challenge to beat. In fact, there are no extra men. You only get one life. I find this approach somewhat refreshing in that it makes you get more into the game and winning really feels like an accomplishment. There are three different options for the controls ranging from a virtual d-pad to swipe or tilt. The graphics are handled nicely in a classic arcade style, and the audio, which includes a really nice soundtrack, is great. iFighter is a fun and challenging game full of nonstop action. So if you’re a fan of the old-school flying shooter games this is a definite download, especially at the low price of $1. A free lite version limits you to the first stage of the game, but gives you a taste of what the full version of iFighter has to offer. iFighter is compatible with any iPhone or iPod touch running the iPhone 2.x software update.